E-commerce platform is a complex system in technical terms. In order to make all the pieces work together, you need a reliable technology that will support it. 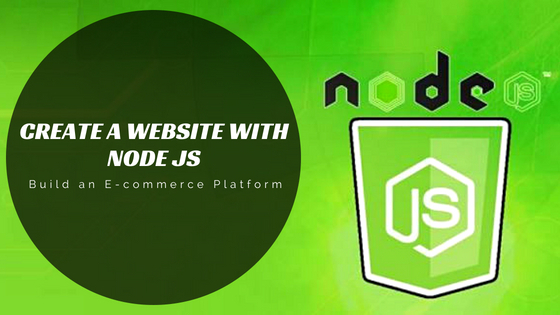 Node.js is fast, secure and scalable but how to make sure that it is the ideal match for your e-commerce platform. Node.js supports multitasking by providing excellent results with lower costs. As compared to PHP, its way more convenient. Since the buyer’s journey on an online e-commerce store involves various operations like changing product features, choosing payments, adding things to the basket etc., it is quite critical from the performance point of view that the technology serves such tasks in an effective way and that’s exactly what Node.js does. Node.js allows quick scalability. Within a short period of time, your e-commerce store can grow substantially. It is an essential factor to take into consideration when selecting the technology before you create a website with Node Js. It actually has an inbuilt mechanism which helps in managing the scalability and adjusts it to your individual needs. Node.js comes with a lot of good packages which can be easily executed in your mobile app. That way, developers don’t need to write anything from scratch but can make the most of reliable open-source solutions. It increases the development speed and there are a lot of many packages available for e-commerce too. There are various front-end frameworks like: React, Ember, and Angular that uses the very same language. So, you can build applications which are isomorphic that is written in one language. It streamlines the node js mobile app development process, the communication between front and back-end teams is a lot easier and they can understand both sides of the code in a better way. js allows the store owners to customize the content on the basis of the device type and browser. This saves a lot of time for mobile shoppers since all the unnecessary information is removed. The ability to support multiple concurrent transactions is what makes Node.js really good for supporting mobile apps which have a high inflow of customers. What makes Node.JS so popular is its asynchronous event-based process. For e-commerce applications, Node.js works as a viable backend with HTML5 as a front-end. With fewer plugins and advanced features, Node.js is a massive platform for supporting your online store. Whether you have one customer, two or thousands of them, Node.js helps you to deliver outstanding performance in every case. The marvelous scalability provided by Node.js allows the user to deliver satisfactory shopping experiences during the sale offers and festive season. Everyone wants their online stores to be developed quickly. With less switching between the front-end and back-end coding, Node.js developers can build e-commerce apps fast and as per quality standards too. Therefore, next time when you plan to get a mobile application, go for Node.js development services and schedule a consultation with the professional team of app developers who develop such a product for your business that it has a long way to go.